HP 8165/8165A Compatible Function Generator - GP1665H | Marvin Test Solutions, Inc. 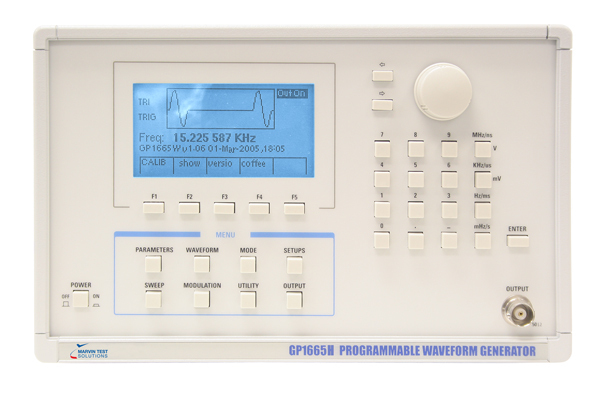 The GP1665H function generator is a programmable instrument capable of generating predefined sine, square, triangle, sawtooth, and DC waveforms. The firmware is customized for the HP 8165/8165A GPIB command set. Software test procedures using the original HP8165/8165A instrument require no code modification when upgrading to the GP1665H. The GP1665H offers phase-lock loop (PLL) for stability and accuracy up to 50 MHz as well as precision low-frequency waveform for trigger, gate, and burst modes. A selectable 20% - 50% - 80% duty cycle up to 20 MHz allows versatility in linear applications using sawtooth and rectangular waveforms. The GP1665H provides internal storage of up to 10 complete sets of parameters and settings by using its internal non-volatile memory. This allows current settings to be saved in case of power failure. Additionally, the GP1665H gives users the option of logarithmic sweeps over three decades as well as a VCO mode for sweeps going down to 1 µHz. Trigger and modulation modes are available for applications needing modulated bursts. Trigger modes can be used in conjunction with AM or FM from 1 mHz to 50 MHz. Continuous Continuous waveform is generated, phase locked to an internal 10 MHz crystal reference. VCO External voltage (1 kHz max) from 10 mV to 10 V lin-early sweeps 3 decades up to top of decade in which function generator is set. Twelve overlapping ranges cover 1 µHz to 50 MHz. Trigger Pos. ext. input pulse > 10 ns wide generates one output cycle. Upper level > +250 mV, lower level < 0 V.
Gate Oscillator enabled when ext. input ≥ ±250 mV, disabled when ≤ 0 V. First and last output cycles are always complete. Sweep Provides logarithmic up / down sweep of up to three decades between limits set on the function generator. Eleven overlapping ranges cover 1 µHz to 50 MHz.